Dill and horseradish are a classic and time-honored combination, and the addition of crème fraiche brings all the flavors together. 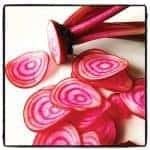 Try to use a variety of beets for this recipe, including golden and Chioggia, which results in an especially colorful presentation. Heat 3/4 inch canola oil in a frying pan. Fry dill sprigs approximately 30 seconds, or until crisp, and drain on a paper towel. Just before frying, slice beets as thinly as possible with a mandoline. Keep the different colors of beets separated. Start with the golden beets, working your way up to the most vibrant red beets. Fry in a single layer, turning midway through, less than a minute total. Drain the fried beets on paper towels, and sprinkle with sea salt and fried dill. Combine the crème fraiche with horseradish and a squeeze of lemon juice, and thin with a bit of milk, if necessary. Season with salt and pepper. Serve the crispy beets with the crème fraiche dip on the side.